Funny how these things go. In the space of two weeks, twice I have been transported back in time, merely by the sight of a coffeemaker. Never mind that coffee is a highlight of my day, sipping its sharp brew through frothy milk with a touch of vanilla sugar on top. That addiction came long after the memories these incidents evoked. The scene is a small cabin in the middle of the Gunflint Trail. 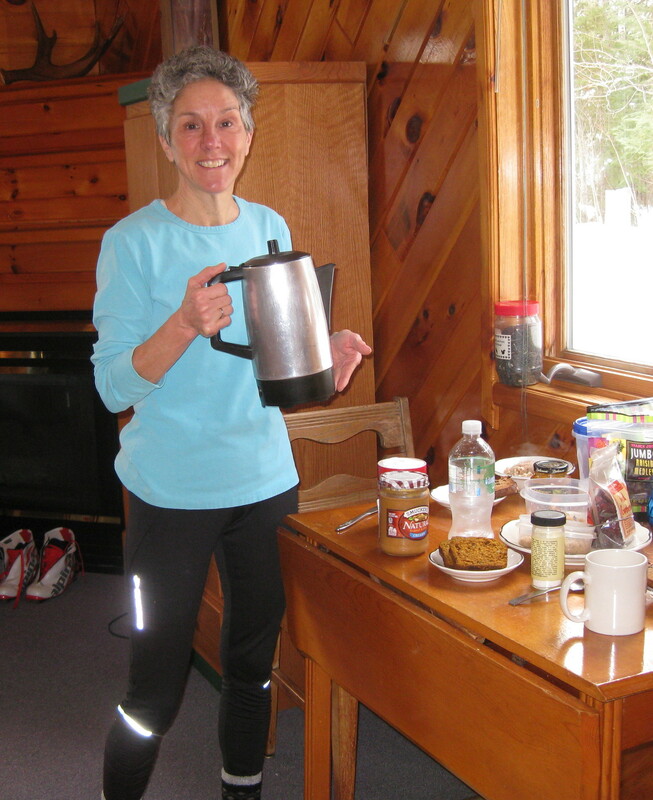 My friend Susan and I are preparing breakfast on the first morning of our annual XC ski trip. We’ve already spent time outdoors, and are looking forward to our morning feast, naturally accompanied by coffee. I’ve even brought my own deep mug and milk frother to create the perfect morning combination. Search as we might, we fail to come up with the standard drip coffeemaker. In fact, the cabin’s accouterments seem a bit slim (what, no wine glasses? the previous night’s discovery). So it brought a chuckle when we unearthed a percolator. Who uses those any more? Will it work with ground drip coffee? It would have to do. And given the circumstances, it tasted divine. Almost anything does after healthy exercise and fresh air, on vacation in a homey cabin. My parents had a percolator later on in life. I remember its sleek design and shiny surface. 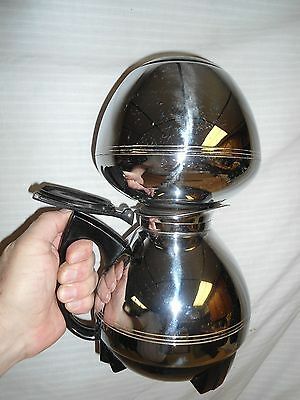 But it was the vacuum coffeemaker from my youth that I identify with their morning coffee ritual. It was quite the contraption. Two bulbous silver orbs, one mounted above the other with a “glass rod” that sat in the slim tube that connected the two. Water in the bottom, coffee grounds in the top. As the water heated, it rose up past the glass rod into the top sphere to mingle with the coffee grounds. Once it cooled, science and gravity would flush it back down again with an audible “whoosh,” leaving behind the soggy grounds. The coffee was done. So imagine my surprise. I sit at the counter with my laptop at my favorite local coffee shop, Amity Coffee. There in front of me is what looks like a science experiment. A bunsen burner sits under a round glass flask connected by a narrow tube to a cylindrical container up top. Sure enough, water in the bottom, coffee grounds on top. Today’s modern version of that relic in my childhood home. 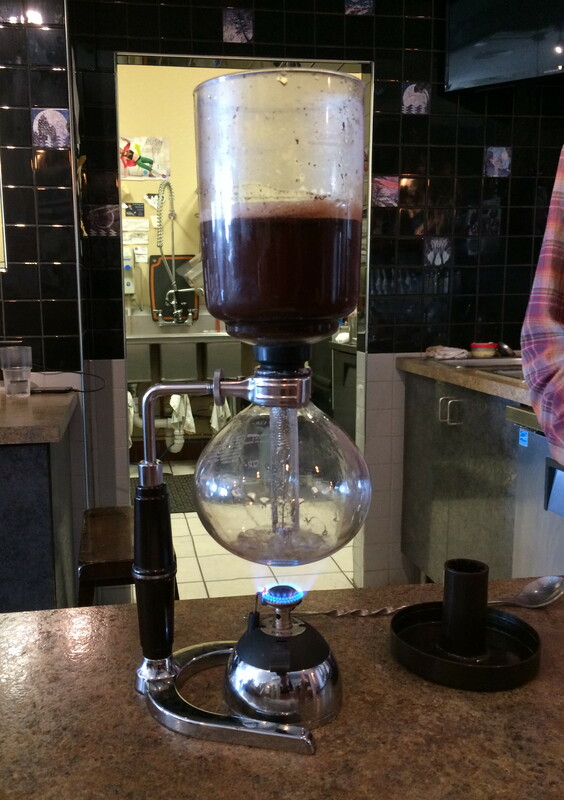 It even has a trendy new name – a siphon brew – and a fancy price tag to go with it, running from $60 to $200. I doubt those who order this specialty have any idea that they are drinking coffee from an old-fashioned contraption. Nor does it matter. I’m the one who has gained more than just ambiance from my morning perch. Who knew that a morning spent with a latté would yield such caffeinated throwbacks? This entry was posted in Family Footprints, Life Up North and tagged Coffee Shop, Family by Molly. Bookmark the permalink.